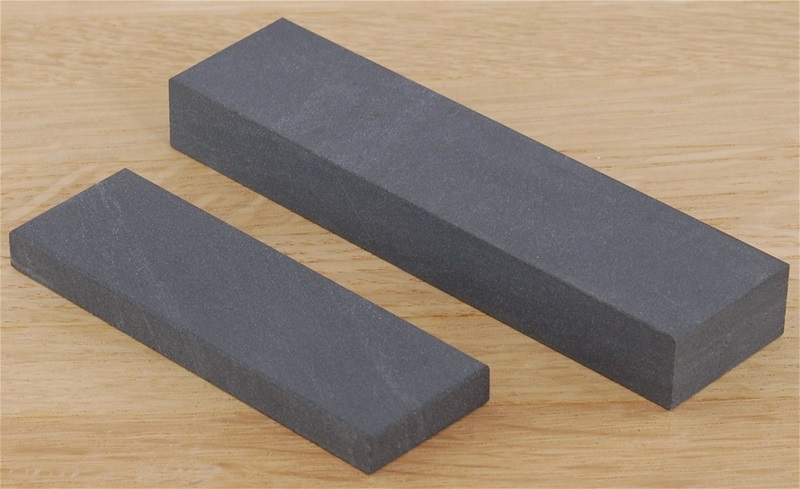 Having a sharpening stone close at hand is often the key to having a sharp tool. These Hard Black Arkansas stones are very fine stones. They work well as a finishing grit or for light touch ups. The Hard Black Arkansas Pocket Stones are available in two sizes, approximately 3" x 1" x 1/4" and approximately 4" x 1" x 1/2". These Hard Black Arkansas Stones come packaged in plastic tubes. The Hard Black Arkansas Pocket Stone With Leather Pouch is also available. Q. How do the grits of Arkansas Stones Compare to each other? A. Arkansas Stones are graded not by grit numbers like other types of stone, but by their density and hardness. The less dense, or softer the stone, the coarser it is. The more dense, or harder the stone, the finer it is. The coarsest Arkansas Stone we carry is the Soft Arkansas. The Hard Arkansas is in the middle of the Arkansas stones, and the Hard Black and Hard Translucent Arkansas stones are the finest. Q. How do the grits of the Arkansas Stones compare to other types of oil stones? A. The Soft Arkansas is a bit finer than the Fine India and the Fine Crystolon stones, and it makes an excellent next step from those types. Q. How fine of an Arkansas Stone do I need? A. The decision of what stone to finish with is a personal one depending on what kind of edge you desire. In general, a Soft Arkansas stone will leave a good edge with a bit of tooth. A Hard Arkansas will leave a more refined edge that is more highly polished. And a Hard Black or Hard Translucent Arkansas will leave a very refined edge that is approaching mirror fine.